Time to celebrate national BLT month! 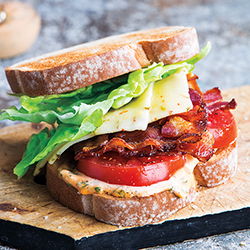 Weave your way into deliciousness with this BLT sandwich… emphasis on the bacon! Be sure to shop our Weekly Ad to pick up the ingredients at a great price. Click here for the recipe video. Preheat oven to 400°; line rimmed baking pan with parchment paper. Assemble bacon into 4 bacon weaves on prepared pan (see step-by-step assembly how-to); bake 20 minutes or until browned and crispy. You need 3 uncooked bacon slices cut crosswise in half for each bacon weave. Weave as shown in steps 1-4 below. Bake in center of 400° preheated oven for 15 to 20 minutes. Transfer to paper towel-lined plate to drain. Try this sandwich with Lemon-Thyme Mayonnaise by stirring together 3 tablespoons mayonnaise, 1 tablespoon Dijon mustard, 1 teaspoon lemon zest and ½ teaspoon chopped fresh thyme leaves. bacon weave. Weave as shown in steps 1-4 below.